The electronic bicycle lock described here is a worthwhile alternative for bicycle owners who want to make their bicycles ‘intelligent’ at reasonable cost. One of the benefits of building it yourself is that the circuit can be used for virtually any make of bicycles. 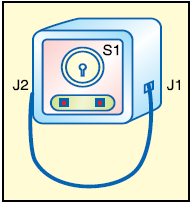 In the circuit, input jacks J1 and J2 are two standard RCA sockets. A home-made security loop can be used to link these two input points. Around 50cm long, standard 14/36 flexible wire with one RCA plug per end is enough for the security loop. Fig. 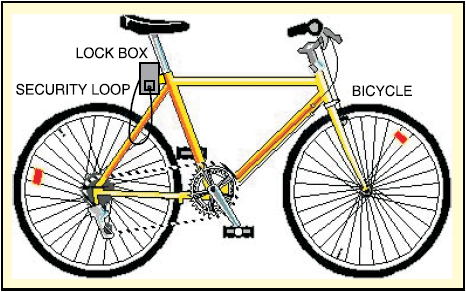 1 shows the circuit of the electronic bicycle lock. It is powered by a compact 9V battery (6F22). Key lock switch S1 and smoothing capacitor C2 are used for connecting the power supply. 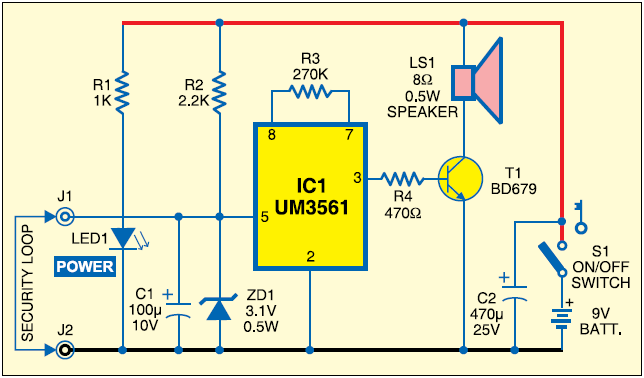 A connected loop cannot activate IC1 and therefore the speaker does not sound. When the loop is broken, zener diode ZD1 (3.1V) receives operating power supply through resistor R2 to enable tone generator UM3561 (IC1). IC1 remains enabled until power to the circuit is turned off using switch S1 or the loop is re-plugged through J1 and J2. Assemble the circuit on a general purpose PCB and house in a small tinplate enclosure. Fit the system key lock switch (S1) on the front side of the enclosure as shown in Fig. 2. Place RCA sockets (J1 and J2) at appropriate positions. Now, mount the finished unit in place of your existing lock (as shown in Fig. 3) by using suitable clamps and screws.